Let the old world charm of Unionville beckon and beguile you. It’s worth the trip! Treat yourself to a relaxing stroll around the block. Stop and shop at the variety of stores, boutiques and galleries. Indulge in some culinary delights. Be it fine dining or some comfort food, a variety of restaurants and bars are here to cater to your every whim. Be sure to check out the Stiver Mills Farmers’ Market every sunday from June to October. There’s something for everyone, be it crafts, jewelry, clothes, antiques or galleries. Pamper yourself for a relaxing afternoon with choices of spas and salons. Main Street Unionville provides a wide array of women’s and men’s fashions from Paris, Rome, New York, California, Sweden, Montreal and more. The variety of clothes range from sportswear, business, casual, formal, bridal wear to intimate apparel. On Historic Main Street Unionville a number of joyous festivals and celebrations are held adding entertainment to atmosphere. 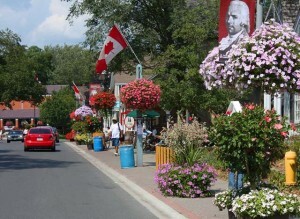 Festivals include the Markham Jazz Festival, the Unionville Wedding Show, Movies on Main Street, and Doors Open Markham. There are many more events to see, so be sure to come and check them out! Fore more information please visit the Unionville website.